The UK's first high-def surround sound sound receiver goes on sale at the end of the month - and at the bargain price of just £400. The Onkyo TX-SR605 boasts Dolby Digital Plus , Dolby TrueHD and DTS-HD surround sound decoders, enabling you to hear Blu-ray and / or HD DVD movie soundtracks at their best. The Onkyo TX-SR605 can also deliver 140W of amplifier power into seven discrete audio channels and comes with two of the latest HDMI inputs, which again enables you to take advantage of the picture quality enhancements that are part of the HDMI v1.3 standard. The TX-SR605 even includes a Faroudja DCDi deinterlacing circuit to converts interlaced video signals into progressive scan versions for viewing on HD displays. Set-up should be easy thanks to Onkyo's Audessy 2EQ speaker calibration system. This helps set the correct delay times and volume levels for each speaker in your room - so you always enjoy the best surround sound experience when you plop down in front of the TV. 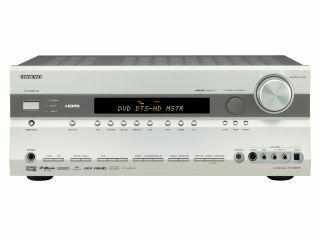 Other goodies include an RDS FM/AM receiver with 40 station presets, and the Onkyo TX-SR605 is fully iPod compatible. All you have to do is add an optional Onkyo Remote Interactive iPod dock and you'll be able to scour your iPod's library for your favourite music, movies and photos using the TX-SR605's programmable remote.